A convenient location for car rental which is away from traffic congestion. Allows 100 cars to depart at the same time. Has GPS practice stations, kid's play area, free transfer shuttle bus, barrier-free reception counter for wheelchair and also certified vehicle maintenance facility! Next to Omoromachi Monorail Station (Yui-Rail). About 19 min from Naha Airport by Yui-Rail. This office is conveniently located on the 2nd floor of DFS T-Galleria shopping mall in Naha New Urban Center. Access to Naha Airport and other areas in town is easy as this office is located next to Monorail (Yui-Rail) Omoromachi Station. Enjoy shopping at T-Galleria after returning the car. Approx 5min by free pick-up service from Yui Rail Akamine station! Akamine office is very convenient for passengers taking the Yui Rail (Okinawa monorail)! Pick-up service from Yui Rail Akamine station available (aprox. 5 min). For details, please click here. Only 2 min drive from Shin-Ishigaki Airport! 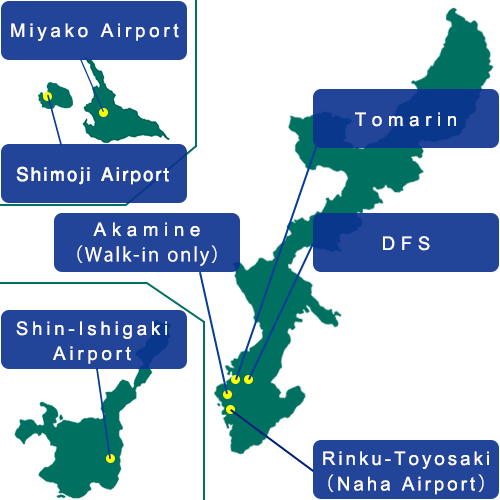 ・Free transportation service from and to Shin-Ishigaki airport. 5 min from Miyako Airport by car. Miyako branch is only 5 minutes from Miyako airport by free shuttle service. Very convenient as you can rent a car immediately after arriving in Miyako Island. Available Hybrid vehicles for rent, fuel-efficent and comfortable to drive! ※For bookings made after January 1, 2018, hotel and cruise port transfer service will no longer be available. For customers coming from places other than the airport, kindly make your own way to Miyako branch for car collection and to your next destination after car return. We appreciate your kind understanding. 2199-1, Hirara Shimozato, Miyako jima-shi, Okinawa, Japan. Rent a car directly at the airport! ※ Locate this office by entering below Map Code to the GPS equipped in the car. Sorry! We are currently updating the information.